The Dark Knight turns 80 this year, and to celebrate Bottleneck Gallery is taking a look back at the history of DC Comics’ Caped Crusader, Batman! In March of 1940, Bill Finger wrote the first issue of Batman’s second starring DC Comics comic book, and introduced the world to Batman’s tragic origin, as well as his iconic nemesis, the Joker. To honor Bill Finger and Batman’s amazing 80 years, BNG has worked with DC Comics to create a high quality, limited edition screen print of Batman #1’s cover artwork! 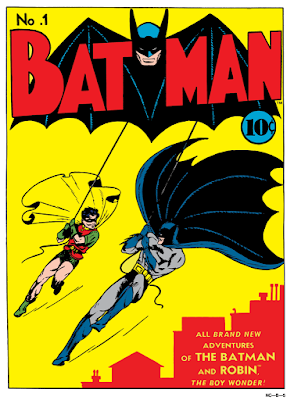 Batman #1 Cover Artwork by Bob Kane and Jerry Robinson has been reproduced as an 18”x24” hand numbered screen print. Limited to just 200 pieces, this DC Comics poster will go on sale at 12pm EDT today, Tuesday, April 2nd, at the Bottleneck Gallery online store for $50.